An elite, ultra-transparent sonic sculpting tool. Designed by Brainworx, the elysia• alpha compressor Plug-In Collection for UAD-2 and Apollo interfaces is a faithful emulation of the powerful, ultra-high-end, Class-A hardware used for mixing and mastering. Fetching over $10,000 new, the alpha compressor is nearly unmatched amongst dynamics processors for its openness and clarity. 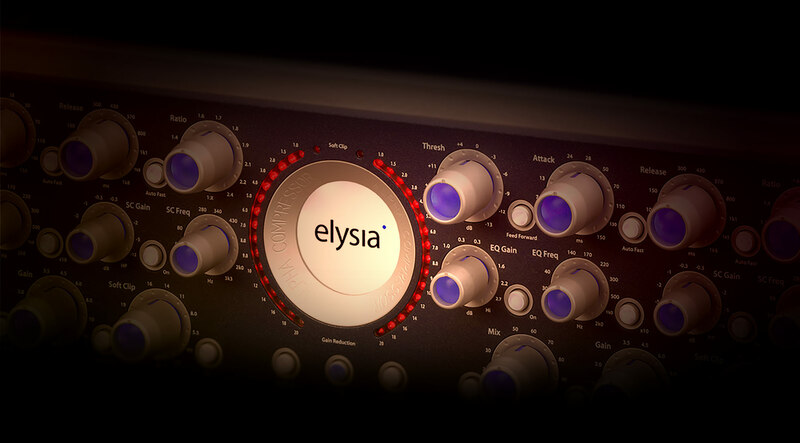 Authenticated by elysia• GmbH, the elysia• alpha compressor Plug-In Collection features painstaking component modeling to capture the sound of the original hardware. I demoed this along with a couple other compressors in the price range, this won, hands down. very transparent, but very powerful. at first, its pretty daunting to look at, but, its laid out logically and you'll get used to it. just put it on your 2 buss, or any instrument buss, and go through the presets(on a orchestral string buss, its amazing). the "mix" version is very nice to have to, but it doesn't save THAT much CPU. Having only recently got this I am still getting my head around it, but my first impression is it's a fantastic piece of kit that has some really great effects on the dynamics and it is stunning on vocals. I'm using both the mix and mastering version within projects depending on what I am trying do to but it's an impressive tool. I've swapped a number of compressors to this one instead of the Neve 6609 in my projects and achieved some great results followign the swap, although the Neve is also fantastic depending on the sound type. Highly recommend. It's expensive, but there's a reason it is. It's great! The Elysia Alpha is one of those special tools that leaves a mix transparent and sweet. i like to flip through presets, watch the changes, and get a sense for how it works. The overall clarity and integrity of this plugin is reminiscent of the natural compression I'd hear in a mastering house. It seems to add subtle detail to a mix. I've used it on a mix bus, and on groups, where it gives an identity to each sound and glues it all together. it shines on a stereo mix because of the way it handles complexities. I'm also using the the Manley Variable Mu, which I like a lot as well, and both offer a choice for various material that I appreciate. Hope this helps. It's actually the first time I am writing a review, but I am really amazed by the alpha compressor. Especially in mastering you have plenty of possibilities to make the mix sound much better and convert even demos into a nice production, bring up details without getting nasty artefacts, and achieve crazy loudness if you want. I feel like remastering all my old mixes. Great plugin! This plug makes in my opinion more than other available a refined and smooth sound on high-end level. It`s absolutely recommended to try the wonderful presets, which are more than a starting point. Many thanks to UAD for a phantastic work and an excellent price-performance ratio to bring this worldclass sound into the DAW also for homerecording studios. I`d like to invite you to watch my new music video (http://youtu.be/MJITCIsagU0), which offers the possibility to see most of UAD-Plugs in action. I have purchased many UAD plugins. All of these provide important and useful engineering tools. However, none are as broadly useful for mastering as the Elysia Alpha Compressor. Used on the master track, this plugin brings a quality to the final mix that previously has been out of reach for me. I am especially thankful for the ability to test low compression ratios in the preset options. These can be tricky to get right. The Elysia Alpha makes it easy. The soft clip and fast forward options on the plugin give great flexibility in achieving the sound I want in a final mix. The Elysia Alpha immediately became my go-to plug in. Can’t live without it! I don't have the UAD version, but I've been using the Brainworx release for over a year now. This is one of the must powerful yet subtle Buss - Mastering compressors I've ever had the good fortune to use. The range of lighter ratios, combined with the auto attack / auto release responses make this a phenomenal compressor, capable of giving a group buss or mix buss the right amount of dynamic control to pull the mix together. Add the Mid Side option, the side chain and Niveau Filter (similar to the Tonelux Tilt) and you've got one powerful and versatile weapon capable of a wide range of tasks. A nice selection of starting presets are provided, with descriptions, and a few cool presets like UberWide. Truly a 'desert island' compressor. You can buy the native elysia alpha compressor plugin for $170 less!!! WTF??????? Wish I didn't just pay $299 for it! Not so sure it was worth what I paid for it. Consumes lots of resources. Probably shouldn't have. Le mode m/s juxtaposé au ciblage de fréquences permet facilement de travailler un master sous différents angles. En mix l'alpha permet également une approche différente de ce que je trouve habituellement dans les comp "typés & vintage"
Vu ce que délivre le soft, le hardware doit être très impressionnant. Amazing MS compression and Eqs! Great compressor for stereo bus, MS comp and EQ!A great tool to have! You can easily get SSL-style punch or extremely transparent compression. The soft clip function sounds like crap on masters, but that's to be expected with most basic clippers. Perfectly useable function for individual tracks. The 'warm' button also sounds great, I really like the linked M/S over unlinked for mastering as well. This isn't just for mastering, but an extremely detailed mixing or tracking comp. I use the Elysia Alpha Compressor specially for M/S Compression. Sounds smooth and up front! Transparent sound, production width, and some mid-frequency and low-frequency upgrades, some songs are still very suitable.